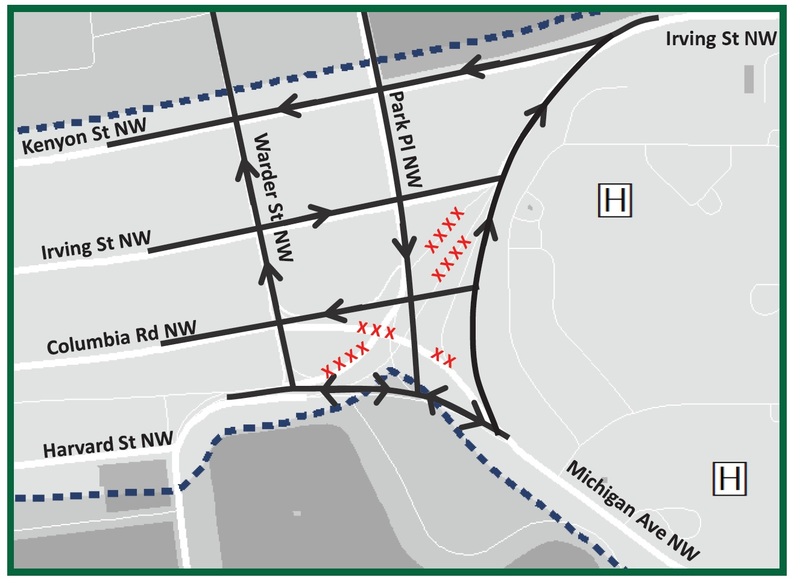 Final Crosstown Study Offers Interesting Recommendations | Park View, D.C. 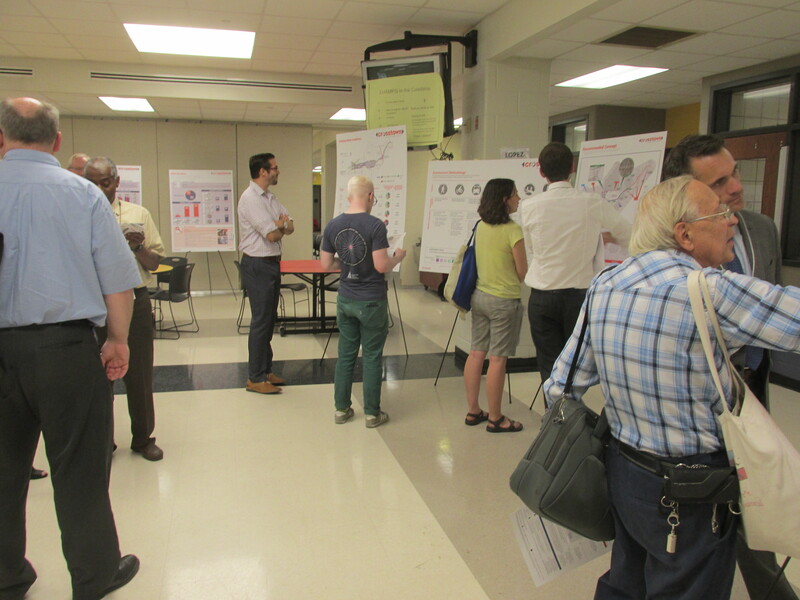 The fourth and final Crosstown Multimodal Transportation Study meeting was held last night at the Columbia Heights Educational Campus on 16th Street. At the meeting, DDOT representatives presented a list of recommendations based on the feedback from the previous meetings to improve all modes of transportation moving east/west between Columbia Heights and Brookland. The full set of presentation materials will be publicly available soon, but in advance of that I am sharing a few of the proposals that were presented that are relevant to the Ward 1 community. It is important to keep in mind that some proposals would require additional community engagement and be longer-term goals rather than immediate goals. Modified Barnes Dance in Columbia Heights — One of the shorter term projects to be proposed is a modified Barnes Dance at the intersection of 14th and Irving streets. The project will require signal timing modifications and potentially a new signing and marking plan to accommodate new crossings at the intersection. DDOT recommends that the project be moved forward in 2017 with a duration anticipated to be 12 months. Cycle Tracks and Dedicated Transit Lanes — A bi-directional cycle track is proposed for Kenyon Street between the hospital center and 14th Street. It has not been decided if the track would be on the north or south side of the street. This project could move forward as early as 2018 with a completion date a year after that. A longer term proposal is to create dedicated bus lanes running westbound on Columbia Road and eastbound on Iriving Street as shown in the map below. These are longer-term efforts that could move forward around 2020 and require more than six years to complete. Reconfigure the Street Grid between Park View and McMillan Reservoir — One of the areas of greatest interest to Park View residents has been the reworking of the street grid at the southern end of the neighborhood near the hospital center. The configuration that is being proposed can be seen below. While there are some short term intersection improvements that could begin as early as 2018 in the area of Michigan Avenue and Hobart Place, the overall project to simplify the intersections within the existing road network would likely not move forward before 2021 with a duration around six years or more. This entry was posted on September 14, 2016 at 7:01 am and is filed under DDOT, traffic. You can subscribe via RSS 2.0 feed to this post's comments. Other than the long time frame, everything is good news in this proposal! Surprised the Barnes Dance isn’t at 14th/Park/Kenyon, that intersection is real mess. People just cross willy-nilly because the lights and crosswalk signals don’t make any sense.